On Mondays I often find myself wandering around Yotsubashi and the Horie area, which is always full of creative shops. 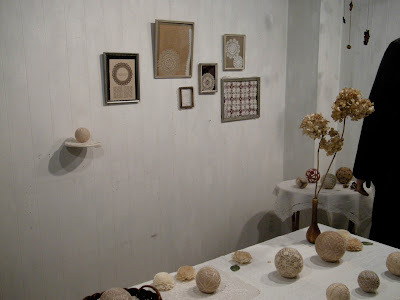 I can't remember where I got the flier, but one particular Monday I found myself in Gallery Shamua, talking to Hitomi Nuno about her exhibition 'Grand Mary'. Hitomi also works in the Zakka on the floor below. 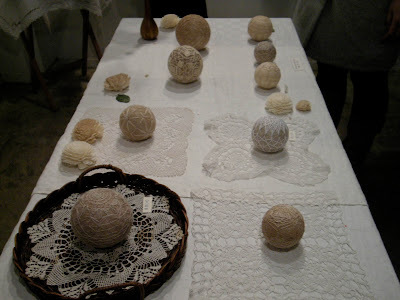 The exhibition featured lots of handsized Temari • てまり comes up in the dictionary as a traditional Japanese Handball game. They're like balls of twine, but each with it's own unique pattern. She said that each one takes quite a while to make, usually the better part of a day. There were also a couple of very nice flip books featuring Temari that Hitomi San had made. Gallery Shamua is a single room right up on the top floor (4th), and pops up in quite a few blogs. The hallway out the front of the Zakka on the 3rd floor is also a great information resource for all things creative.